The confection sizes which I use are based on the European sizes. Every country uses it own size tablet, I made my own tablet (stubborn as I am) 🙂 by middling all the different tablets. I am a man from sizes, give me the right normal body sizes and I know what is possible and what I have to and can do. Don’t come with the size that is on the corset you already have, but measure it on your body. Then you now what the real situation is ! 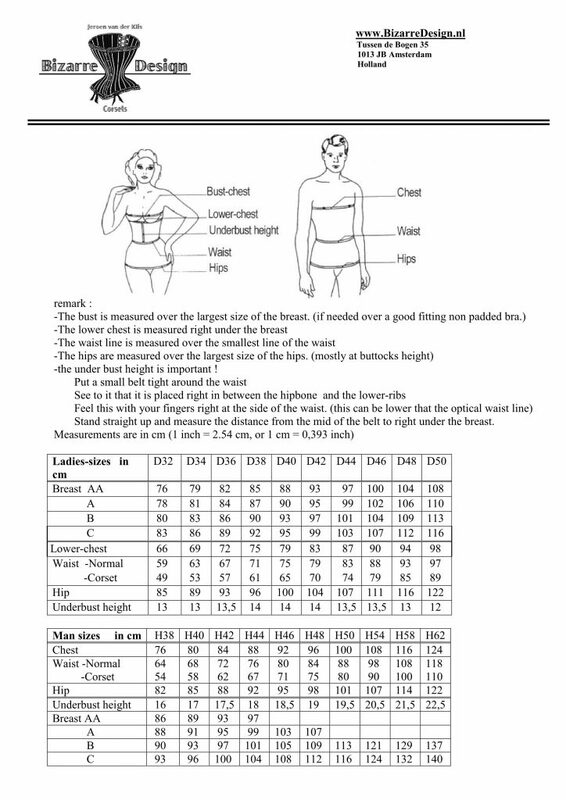 I don’t use the often used 22″, 24″ size system for the corsets, I just think they does not give enough information about the corset size and often create confusion. Girls which are laced down till 22″ and like to get a smaller, they order a 20″ corset but then start to complain about bruised hips and painful ribs. That is not surprising they just ordered a totally smaller corset and not the same corset model with a smaller waist and that is some thing totally different. It is like you have a skin tight skirt already and you try to fit in a size smaller …. it will just not work ! A standard sized corset is made so that when it is laced totally close it will have the size which is in this list. A corset has some flexibility but there are limits. Behind the lacing BizarreDesign has a back protector which gives you a maximum of 6cm to 7cm (2.5 inch) play room. It can be that the lacing will not be nice and parallel to each other, but the corset will still fit nicely. Overall, the wider you have to leave the lacing stand open the poorer the fit will become.